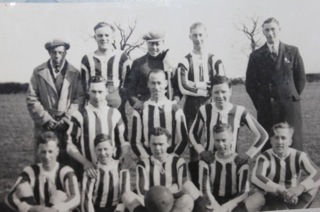 This recently discovered photograph has details of initial and surname of all the team. No date is given but an estimate is late 1930’s. Back Row. A. Clarke, J.Stewart, E. Speller, E. Leeds, L.Shuttleworth. Middle Row. J. Childs, G. Baker, R.Tyler. Front Row. J.Chapman, R.Speller, A. White, A Balls, L.Wilson. I would be happy to hear of more details if anyone can oblige. Thank you. Graham Speller.